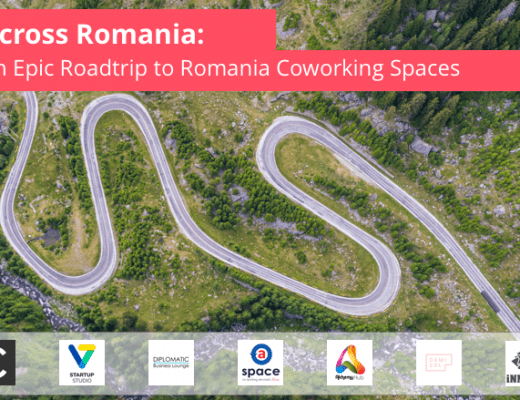 A trip to Romania to discover its growing coworking spaces scene was long overdue. I was personally itching to go back to Bucharest after one year (read my previous visit report here). But that would not suffice. 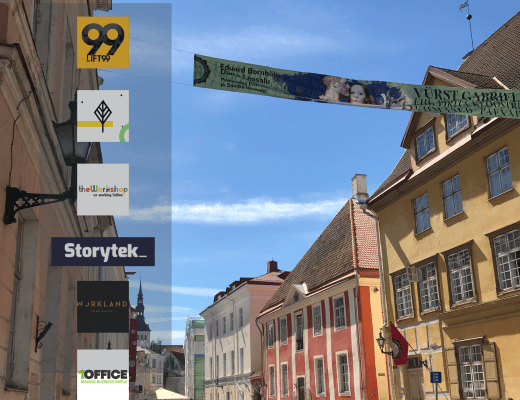 I had to extend my coworking trip to Brasov, Cluj, Constanta and few other cities as all I was hearing was so positive. We have been hearing the news about new coworking spaces opening. And even some big international brands announcing their plans to launch in Romania. So the time was just right. After our Bulgaria Coworking Spaces and Hungary Coworking Spaces roadtrips, the planning was easy. Our dear Vanda being on the ground made it even easier. We put everything on a spreadsheet in under a day, but, “oh, wait, Romania is big, distances are huge. We can’t make all this in one-shot!” was my reaction. But we did it, to a good extent. 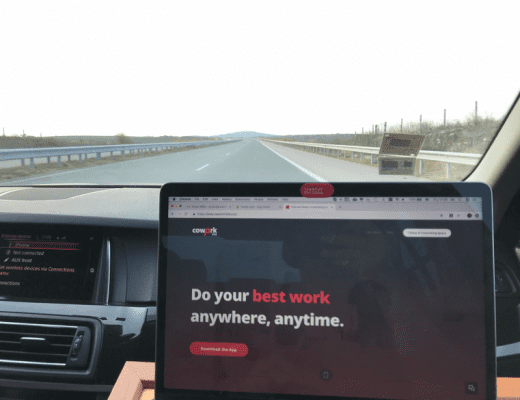 In this one week, we managed to visit 20 coworking spaces in 6 cities, in 7 days, driving 2800 km on the “Istanbul – Bucharest – Brasov – Sfantu Gheorge – Cluj – Timisiora – Belgrade – Istanbul” route (ok, Belgrade was a convenient add to the route as it was on our way to Istanbul!). 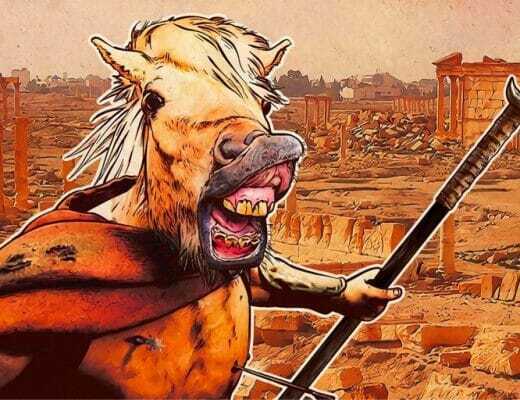 The evolution of Romanian start-up scene has been very promising. Romania is emerging as one of the best locations for startups and investors in Europe. With over 200 start-ups, and over 150 million euros of funding in the last 12 months. Add to that the availability of EU funds for innovation, that direction of growth is not surprising at all. This positively impacts the supporting ecosystem, like the coworking spaces. However, the young talent in Romania leave for other countries given the opportunities in making higher salaries. This is quite controversial, and gives the local start-ups and coworking spaces an added responsibility to provide the right environment to keep the talent at home. They should focus on community, capability and skill building, networking opportunities, and act as an enabler to access to funds. 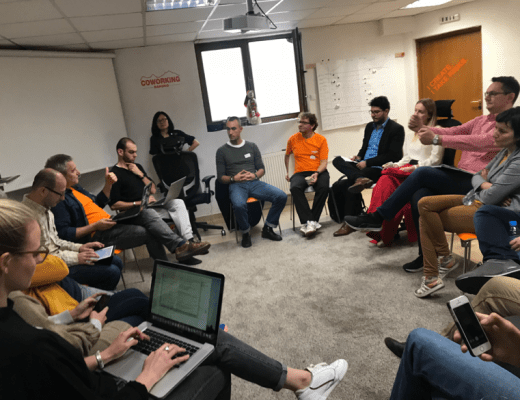 This has been one of our main curiosities before we started the road trip, and we can confirm that many coworking spaces are indeed stepping up to assume the responsibility to build and grow their communities. And they are doing that with awesome joy. We spent the whole day Sunday, September 16th, on the road. Given that you have to cross 2 borders, and at least half of the total 650 km is on one-lane country roads, it took us almost 10 hours. But otherwise, Istanbul to Bucharest is a very smooth drive, just that it takes long. Daniel, the Community Manager of Commons Lounge has greeted us warmly as we arrived in one of Bucharest’s trendiest coworking spaces. Commons Lounge offers a very large open area for freelancers, entrepreneurs and young professionals. They have an activity-based design with a great choice of furnitures and decoration. The whole space resembles an enormous living room, but is absolutely better than that. 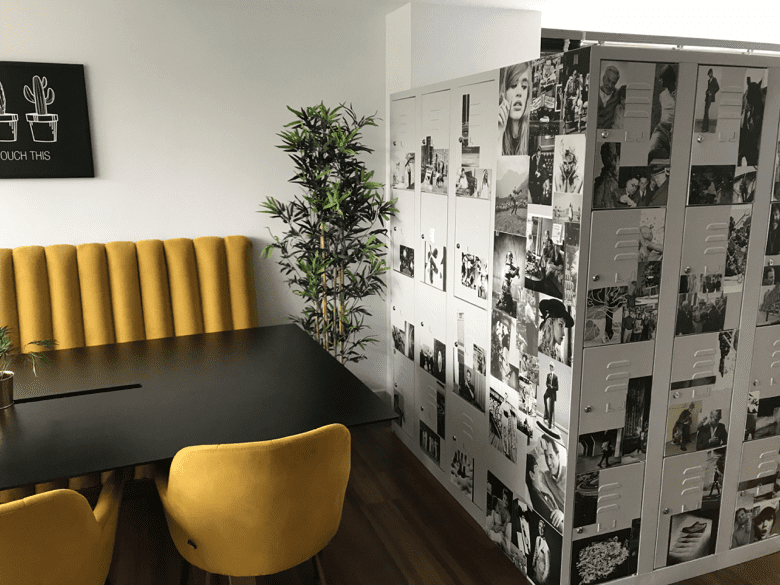 Two phone booths for private calls, and a variety of “corners” for collaboration or team-chat, like by the fireplace or kitchen, or spots for private and quiet, undisturbed solo-working. 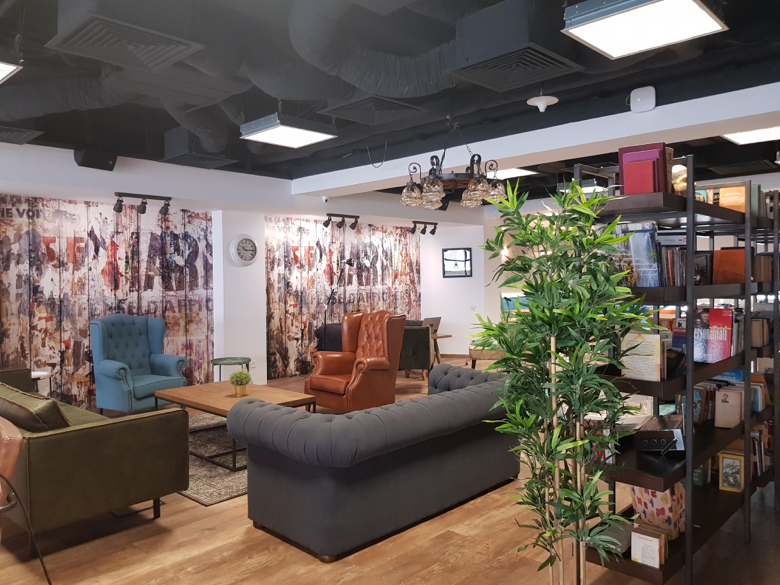 Commons Lounge has opened their doors around a 1 year ago, in November 2017 at Unirii, and then later opened their 2nd location close to “Romana square” which offers dedicated desks and private offices to larger teams. Usually once a week, they are offering a community breakfast with free snacks, however, as they are providing a full kitchen, you may bring your own food too. Coffee, tea and water is free at all times. Their prices start at 18€ a day, and go up to 1.900€ a year. Monthly and annual coworking space membership includes meeting rooms and printer credit, while the day use grants discounted rates for meeting rooms and printing. For digital nomads, they are happy to offer customized packages based on personal need, said Daniel. 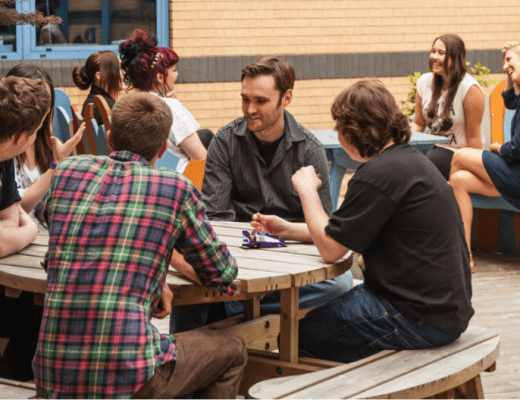 Their meeting rooms are available for external bookings as well, and can be booked online through their website, though we are hoping they will be bookable on Cowork7/24 app too, soon. Check out a few pictures we posted on Instagram. We’ve also visited their 2nd location, Commons Romana, where they are providing private offices and fixed desks mostly to start-up teams, at “Strada Nicolae Iorga 5”, where Laura and David Canta explained about their exciting plans to grow further in Europe. In this nicely decorated, upscale office, they are hosting around 50 coworkers from various companies and start-ups in Bucharest and not only. V7 Studio aspires to start as a coworking space, opening Oct 1st, 2018 and grow into an incubator. 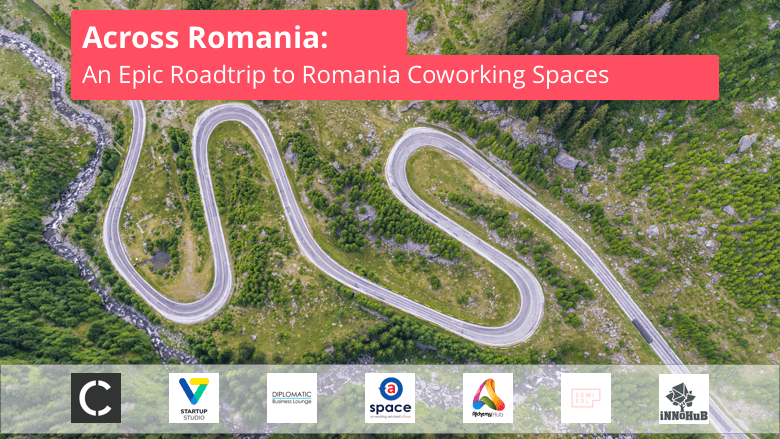 Founded by the founders of 7 Card, the aggregator for gyms in Romania, V7 Studio would like to be the coworking space for start-ups to come, to build their network and get help, or even investment, to grow, explained to us Andrei, the Community Manager. We got the chance to have a quick sneak peek and I have to admit the place is going to be as unique as the building it will be in. 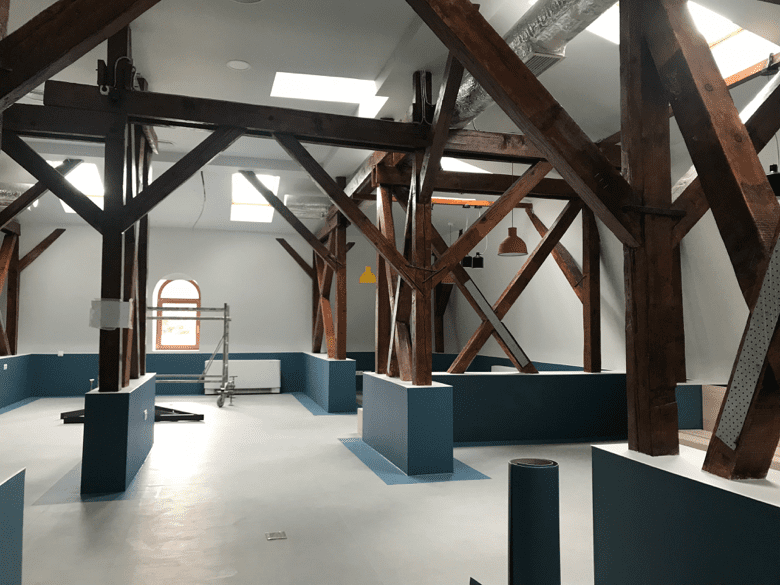 They are also building a Wine bar at the entrance, in order to promote a start-up their founders already have invested into. We are looking forward to hearing more of their opening, and paying them a house-warming visit. Diplomatic Lounge is a coworking space ready to suit your every-day needs, whether you are a start-up company or a freelancer. The comfy design does indeed resemble that of upscale airline or hotel executive lounges, with a very nice bar, and various areas for both working alone, in groups or relaxation. Diplomatic Lounge targets the corporations who may need a room for a meeting, or for an interview, or for whatever business, hence one reason why they have opened the coworking space quite close to the business district of Pipera where they may easily have access to 2000 white-collars to attract to their coworking space. But they are not necessarily targeting corporations to move all their staff, but rather, they want to become alternate location for their occasional coworking needs with an added touch of convenience and luxury. They target people who already have an office, but need a change for meetings internally or with their external business partners. They are also willing to attract those business travelers who come to Bucharest for business. Talking by experience as a frequent traveler myself, their offer for luggage storage for business travelers is absolutely a differentiator. Their pricing is based on membership, and at the moment they are even offering hourly use, for an hourly rate of 3€, where you pay for your food and drinks on top. Must add that their pricing for drinks is very attractive, incomparably low vs any restaurant or bar of similar caliber around. While they would also welcome walk-ins at this point, they prefer to have their built-up community of business professionals and travelers. “I want everybody to know and love everybody. It’s like a neighbourhood office” says Dan Dumitrescu, the GM. 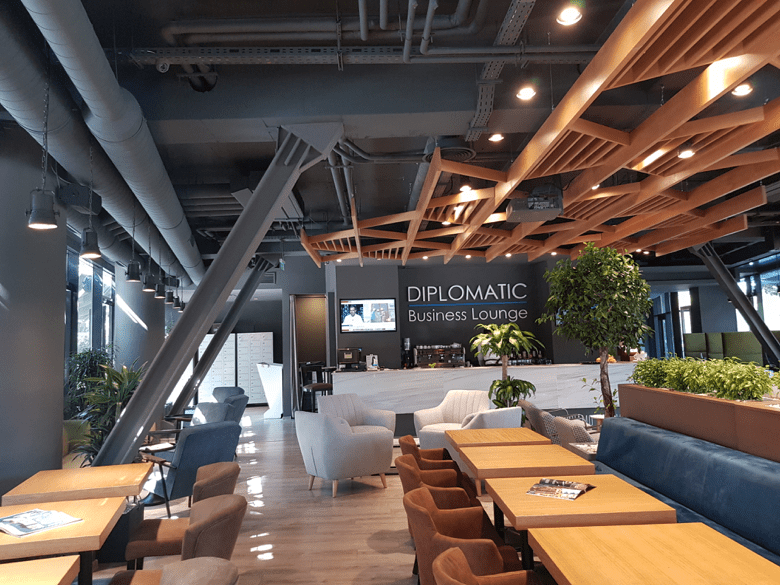 It’s an absolute must to consider working from Diplomat Lounge in Bucharest, at the very least for their impressive design and choice of furniture for enabling you do your work from a very comfortable environment, or to impress your customer and clients. Bogdan Mariniuc, who is one of the co-founders and managing the aSpace, a new coworking space located in northern Bucharest, calls themselves a “start-up”, and this is absolutely right. Aren’t all coworking spaces a start-up in nature? aSpace started 4 months ago (in May 2018) after noticing a gap in the market in this part of the city. They believe in the value coworking spaces bring to the communities and neighbourhoods. They are mainly targeting to attract small start-ups with 2-10 people, and offer them private offices and open coworking areas. 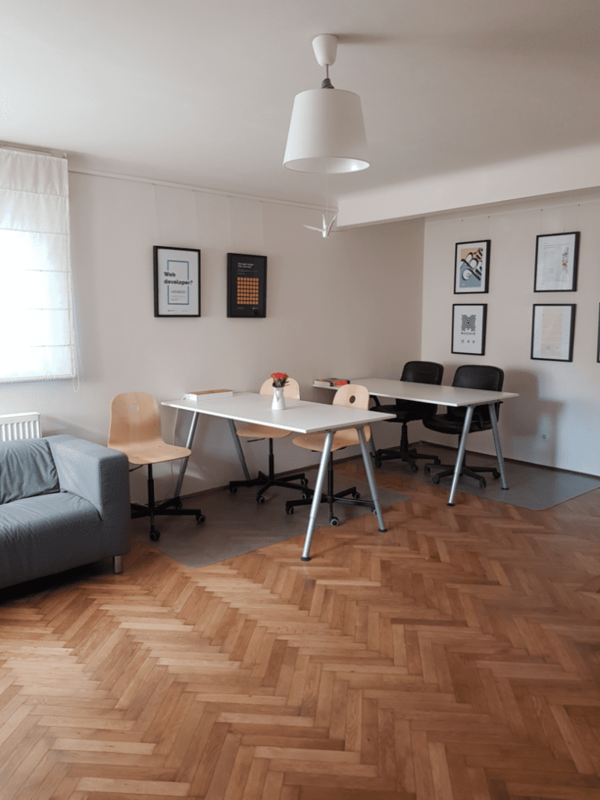 But also, for those traveling to Bucharest for business, the aSpace is a great coworking space to stop by to get some work done before the flight as it’s so close to the airport, like literally 4 minutes walk to Baneasa airport, and 10 minutes drive to the International Airport of Bucharest. aSpace’s prices start from 100€ a month for hot desks, and from 250€ a month for fully-serviced private offices. This is roughly around 40% cheaper than similar spaces, says Bogdan. We called it a day for Bucharest after visiting aSpace. 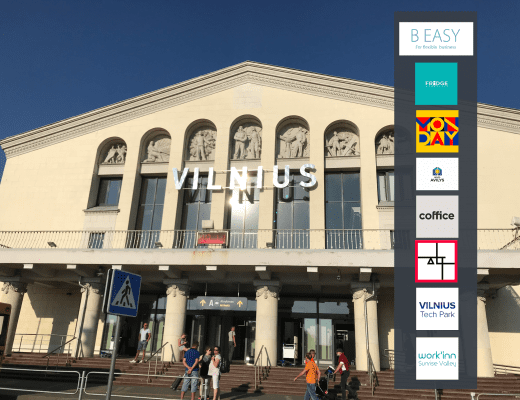 We knew there were many other coworking spaces in Bucharest that we had to visit, but Brasov was calling us, and we had to stick to our plan to discover the coworking spaces across the country. The road to Brasov from Bucharest is quite a scenic one as you drive through the Bucegi Mountains, where you can see the huge Metal cross memorial on Mount Caraiman, commemorating WWI railway heroes. Demisol was founded last year in May (2017) by the Digital Marketing Agency, High Contrast, as a means to create collaboration among diverse minds and a give-back to the community, explained Emilia Jercan, the CEO of High Contrast. Their main motivation was to meet new people, designers, copy-writers or basically anyone from the digital industry to create connections, while willing to give away a space to people to work and to organize events and workshops. They would like people to come and to do project together. “It’s free, and it will stay free forever” says Emilia. It’s also a kind of marketing movement for them, where they also benefit from the synergy created, and have had cases where they were doing hirings from the community or accepting internships. For that, they have built partnerships with Universities, as well as with Organizations like Aiesec to provide internship opportunities in a very creative agency. Their space is small with only working spaces for 8-10 people, but this is already sufficient to create the vibe. It’s free to use, but the expectation is that everyone coming and working from there, has to give back to the community, and preferably, get engaged with the work of the agency, too. It’s not an official rule at all, but an expectation they openly share. Emilia also tells the story of Demisol coworking space on their blog, which we found an amusing read. Alchemy Hub was founded in 2016, and offers two big rooms as open space for coworkers (up to 14 desks), one for training and one for events. 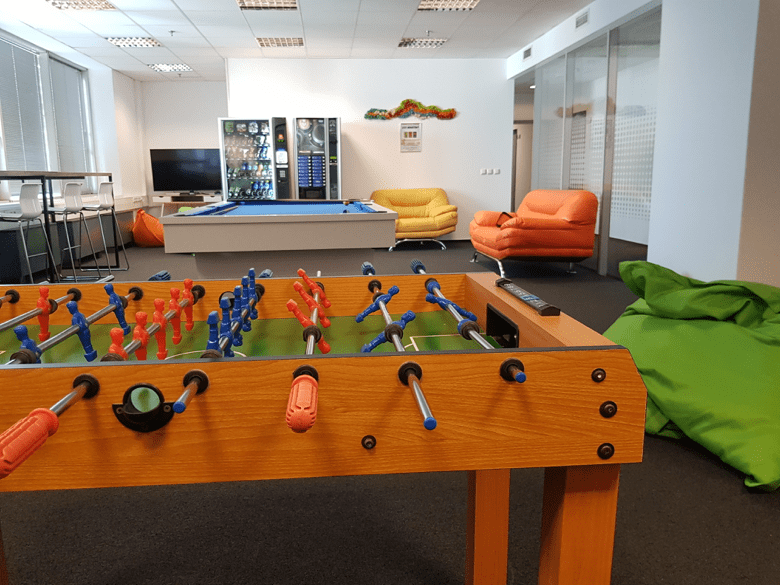 The coworking space also has one big kitchen and all the necessary infrastructure: high speed Internet, scanner, phone/fax, multifunctional equipments, as well as a massage chair and darts game for relaxations. They have started with a big aspiration to provide more than just a working space, but make Alchemy Hub a place for attraction for freelancers and coworkers who want to grow together with others. The principle of alchemy is to bring together different elements (Earth, Water, Air, and Fire) to create something new, the Gold that Medieval alchemists dream about. And “this is happening in Alchemy Hub: you can find clients, mentors, suppliers, you can run ideas, you can ask for feedback from people like you, you can experience and can do a good networking. It is a space where we create synergies and grow together!” explains Roxana, the co-founder and Manager. 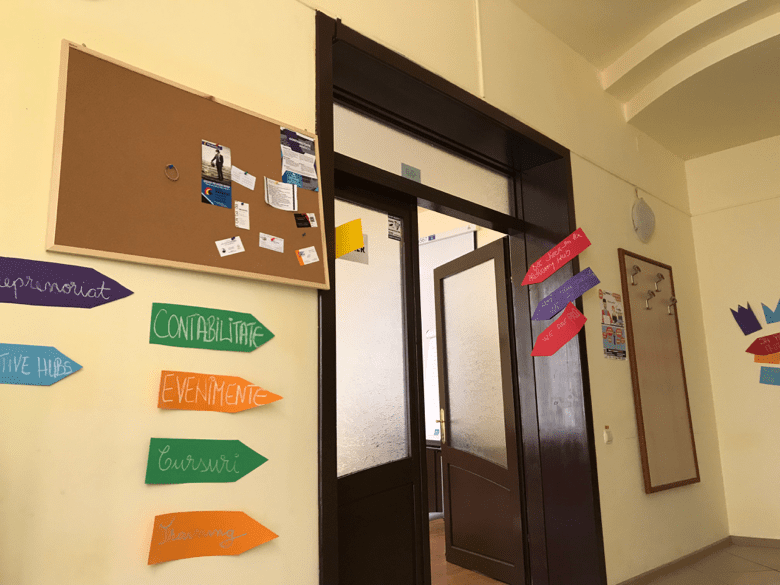 They also have established a community in Brasov, who are regularly joining the to events and workshops, though not necessarily working from the coworking space regularly. Alchemy Hub is also very active to create opportunities from european projects and funds for start-ups. Their pricing starts from 40 RON a day (8 euros) to 440 RON a month. Location-wise, they are located in an ultra-central area, in the business area of ​​Brasov, in the Civic Center, nearby banks, institutions, lawyers / jurists / mediators offices, but also various shops, restaurants, pubs, park, sports halls, hospitals, church, hostels, sports ground, etc in Brasov. With public transport being very close, and with various parking options, it’s quite convenient to get to Alchemy Hub. Despite our searches at the address of Horia 53, we just could not find an entrance to this Cafe-coworking space in Brasov. Later, to our fear, we have confirmed with them that they are currently closed. Romania is big, and distances are huge. Also, due to the road conditions, there was a 4.5 hour drive in front of us to Cluj-Napoca so we rushed to leave Brasov after a quick tour in the beautiful center. We were a bit hesitant to stop by at Sfantul Gheorghe (aka Sepsiszentgyörgy), at Innohub, given the long driving ahead, but thanks God we did! Innohub was founded 3 years ago. What initially started as a little project of Eniko Mutyas and her Boss to complement their Incubation Center (which is Romania’s only business incubator operating for the last 11 years and founded by UNDP) has now become a center of connection for local freelancers, students and young talents. Sfantul Gheorghe is a very little town, but they have some very competitive and international companies. However, the talent community is not so big as in Bucharest or other big cities. This was initially a question mark for them, that whether it would be relevant to establish a coworking space there or not. But apparently, it turned out to be a very good decision to do so. The coworking space is an organic part of the business incubator. Currently more than 50 companies and business are residing at the incubation center,. While all other incubators had to stop their operations after around 2 years, Innohub managed to sustain their business without any public money or public support. And on top, managed to open a coworking space and keep the monthly pricing at as low as 35 euros a month. This is not a traditional business model like the other coworking spaces. But they have a purpose, and are delivering inline with what they have aspired to do. Given that the coworking space is small in size (18-20 desks), they prefer solopreneurs or freelancers from their 9 fields of expertise, but also accepting pretty much anyone unless what they do as an entrepreneur is not so well relevant to good of the community (like: they don’t accept MLMs). They are supporting their community with the other human resources they have in the incubation center like lawyers, and mentors from different areas financing, management, PR and internationalization. In the last 3 years, they have hosted more than 100 events, which were open to public, too. They have a passion to attract more digital nomads to ensure a good diversity in the community, but given that Sfantul Gheorghe is not really a transit city, their efforts have been limited. However, given the low-cost of living, the beautiful nature and the awesome coworking space we believe there is great potential to change that. We called it a day with the Innohub visit. The road to Cluj-Napoca was long, and the week was still young. 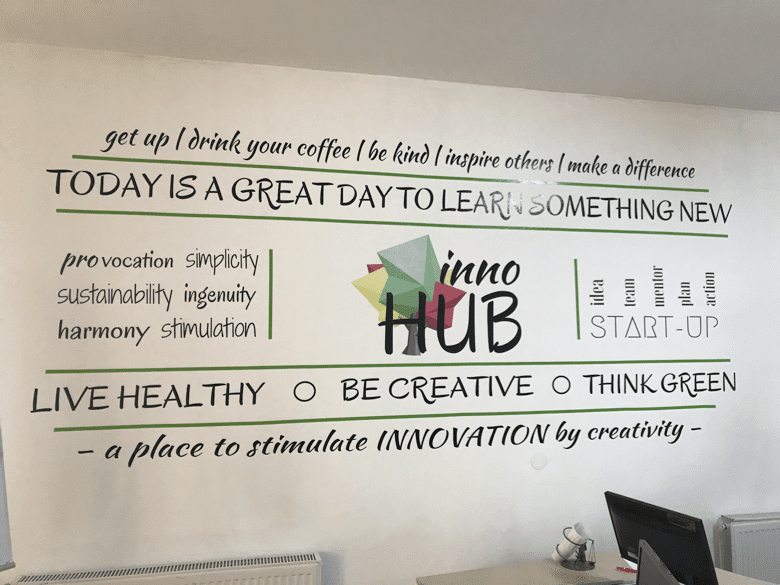 Stay tuned for the second part of our roadtrip, where we visited the coworking spaces in Cluj-Napoca and Timisoara. Are you looking for a coworking space ? download our app here for iOS and here for Android. Founder of Cowork7x24. Making Coworking easier by enabling more&more people work from whereever they like to. Calls Istanbul home, though is usually on the road. Works from anywhere. 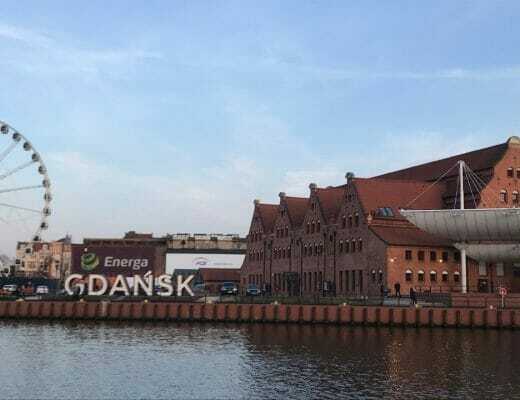 What CoworkingNow 2019 has taught us! 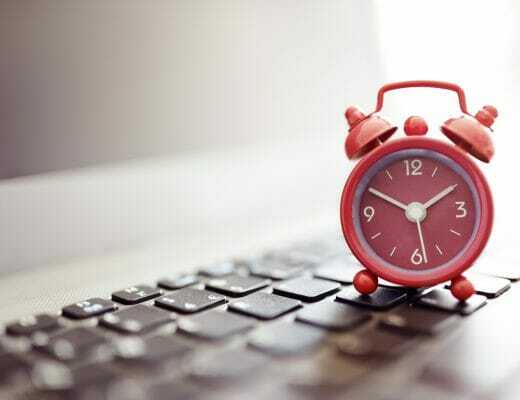 Should freelancers be available for clients 24/7 ?